Q. Can you fix discoloured and unsightly crowns? A. Many patients will notice that old crowns, or improperly fitted crowns, over time, begin to show a dark line or margin where the crown meets the root of the tooth. This is caused by gingival recession and over-eruption of the teeth. The best way of correcting this is to carefully remove the offending crowns, adjust the margins of the tooth preparation and make a new crown that has no metal margins. There have been tremendous advances in the manufacturing of metal-free crowns and their strength can match that of conventional metal-based crowns. Examples of the these crowns are Empress, Procera and EMax, all of which we at QRDC are trained to place and perfect. More information can be found in “Crowns & Bridges”. Q. Why are my front teeth worn down and/or chipped? A. Tooth wear is very common in patients who grind their teeth. We find excessive tooth wear in cases where the front teeth are positioned to lean backwards, called a “Division 2”. These teeth are subjected to severe wear and grinding forces and can make the teeth appear shorter than normal and very often become fractured, uneven or chipped. We can rebuild the teeth by making crowns, veneers or tooth coloured composite material buildups. Alternatively, permanently re-positioning the teeth with orthodontic treatment is more likely to prevent further wear in the future. Ask Dr Stefan to assess whether it is the position of your jaw that is the problem, as ideally, treating the underlying defect causing this behaviour will eliminate the need to continuously repair ground down and chipped teeth. More information can be found in “Smile Makeover” and “Orthodontics”. Q. Can you fix my gummy smile? or Why does my gum line look uneven? A. A gummy smile is almost always attributed to a severe ‘Division 2’. This means that the front teeth are leaning back excessively and will give the appearance of a “gummy smile”. The front teeth in these cases have often worn down, over-erupted or appear to be shorter than others or dropping backwards. Treating these cases can be achieved by orthodontic treatment, or by a procedure called “surgical crown lengthening”, where the gum is repositioned by carefully reconfiguring and reshaping the gum using the latest surgical procedures. Q. Can you sort out my overcrowding? A. Overcrowding of the teeth is caused by the dental arches (bone of the jaws) not being the desired size and shape to accommodate all the teeth and can occur with baby teeth or permanent. Traditionally, orthodontists will extract or remove healthy adult teeth to make room for the re-alignment of the remaining teeth. At QRDC, we use the latest advances in orthodontic techniques to align the teeth, even in adults, by creating space for the crowded teeth by expanding and developing the dental arches. Gone are the days where you had to suffer painful, traumatic extractions to correct overcrowding. The expansion of the dental arches gives a wider smile and aesthetically fuller appearance to cheeks and/or sunken chins. We also see positive changes in the lip support, facial profile and reduction of wrinkles and facial folds associated with a narrow upper jaw. Not only will your teeth look perfect, but the cosmetic result can be equally pleasing to patients who might have considered cosmetic surgery to change the look of their cheeks, lips, chin or nose. Bringing the jaw profile into alignment can often rectify these issues – you just need to take a look through our gallery to see examples of how developing the jaw/s can address cosmetic imbalances in your entire face. In these example, a ALF appliance was used to expand the upper jaw while the teeth were aligned simultaneously with fixed braces. For more information take a look at our “Orthodontics” page. Q. Can you fix small gaps between my teeth? A. Spacing or gaps between the teeth are often caused by teeth that are genetically narrower than usually expected. In these cases, we can use porcelain veneers or composite filling material to create the desired shapes and sizes of the teeth for a pleasingly cosmetic, more natural appearance in very little time. Where necessary to prevent future shifting of teeth, we may use orthodontic treatment to move the teeth into a more desirable position before building them up to the perfect shape. More information can be found on our “Smile Makeover” and “Orthodontics” pages. Q. 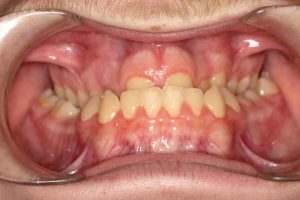 Can you fix big gaps or missing teeth? A. Missing teeth can be replaced by using dental implants, fixed bridges or dentures. At QRDC we use the renowned Astra Tech dental implant system. When implants are used to replace missing teeth, the adjacent teeth are not affected. This is similar to bridges and can often be used in conjunction with bridgework. In the case of implants and bridgework, the patient benefits from not needing to remove and separately maintain a prosthesis such as denture. Each case is carefully assessed individually for implant suitability, as the density and quality of the patient’s existing bone is a major factor when implant placement is considered. Bridgework is a good option when the teeth adjacent to the large gap is of a good, stable condition. Dentures are the most cost effective way of replacing multiple missing teeth. We can also use implants or mini implants to provide further stability for dentures to give them a semi-permanent, more robust result. You can find out more on the “Implants“, “Dentures” and “Crowns & Bridges” pages. Q. Why are my child’s teeth so overcrowded? A. Overcrowding of the teeth is very common and it is important to determine whether the overcrowding is caused by jaw size discrepancy or tooth size discrepancy. It is very rare to have excessively large teeth (Macrodontia), or to have too many teeth. The vast majority of overcrowding cases are a result of under-developed or unnaturally small jaws; most commonly the upper jaw. Unfortunately, most cases are traditionally treated by the profession through tooth extraction to make room for the crooked or impacted teeth. At QRDC, we treat each individual case by determining the appropriate jaw size through careful analysis of the jaws and models of the teeth using the Schwartz Korkhaus method. We then use the latest techniques and appliances to develop the jaw/s to the correct sizes. This treatment is most effective in a growing child, so it is imperative to identify these discrepancies at an early age. Nature is very consistent. Skeletal imbalances that are present at a young age will most certainly still be observed at a later age – often with greater associated problems. Early intervention produces the best results as we put natural growth and function back on track. It also means that by the time your child reaches adolescence, they have avoided traumatic extractions, kept their own healthy teeth intact, have a balanced facial profile and may only require conventional braces for a short period of time for minor corrections before enjoying their perfectly balanced smile! Please note that despite severe crowding due to under-developed jaws, no teeth were extracted in treating both these cases. More can be found on our “Orthodontics” page. Q. Why are my child’s teeth are not coming through? A. The most common reason why our adult teeth do not appear, even where gaps are present, is due to under-developed dental arches. The most common teeth affected are the upper canine or ‘eye teeth’. These teeth are usually the last to erupt and are commonly the ones that do not find enough room in the mouth. It is typical for these teeth to become impacted and traditional methods often require surgical intervention to expose them. This highly unwanted situation can be avoided if the arches are developed early enough to prevent impactions. It is common practice amongst orthodontists to extract perfectly healthy teeth to allow the canines to come through. However, at QRDC we have an exceptionally high success rate in creating space that allow these teeth to come down without the need of extractions. 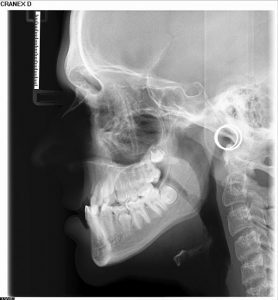 The following 7-year old patient had narrow and under-developed jaws. On the radiograph, it is clear to see that the upper canines had no room to descend. We used a 3D Schwartz appliance, a lower Williams appliance, as well as straight wire treatment to create the necessary space and straighten the teeth. If any other treatment had been pursued she would have likely lost her two perfectly healthy canine teeth. You can find out more by visiting our “Orthodontics” or “Children’s Dentistry” pages. Q. Why does my child’s lower jaw appear so small in comparison to his upper? A. 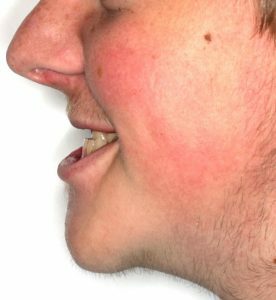 It is not uncommon to see the lower jaw in developing children, teenagers as well as adults, stuck back, giving the appearance of a sunken in chin. This creates a convex facial profile and often gives the impression of the front upper teeth protruding. This is commonly referred to as a Skeletal Class 2. The lower jaw is genetically programmed to be the correct size, or can be too large in size in certain families. The lower law becomes trapped, or stuck back when the upper jaw prevents the lower jaw from growing naturally. The most common causes is a narrow upper jaw, a Division 2 (the upper front teeth leaning back), or a deep bite. This entrapment during the child’s development up until the patient reaches puberty, can cause the lower jaw to not reach it’s genetic potential, resulting in a retrusive (stuck back) lower jaw. We use a sophisticated scanning procedure and analysis (Bimler Cephalometric analysis), to determine whether the lower jaw is growing correctly or not. Early intervention during the growth phase in the patient’s development is essential to correct this skeletal imbalance and stimulate the lower jaw to grow forward the desired position. This correction has a profoundly positive effect on the patient’s profile as well as the health and comfort of the lower jaw. Once the upper jaw is correctly developed with an appliance like a Schwartz appliance, the lower jaw is brought into the correct position with appliances like the Bionator (in mixed dentition) or a Twin Block (in the permanent dentition). Find out more on our “Orthodontics” and “Children’s Dentistry” pages. Q. Why do my child’s upper teeth protrude so much? A. Protruding upper teeth, or ‘buck teeth’ as they may be called, is often an illusion created by an under-developed lower jaw, which gives the appearance of the top front teeth being far too prominent. Excessive thumb sucking, mouth breathing, and tongue thrusting, as well as bottle feeding or feeding babies at an angle where they are forced to swallow in a way that eventually changes the shape of their developing jaw structure. The upper jaw develops too narrow due to the pressure caused by the cheeks, and the front teeth is inclined forward due to the pressure of the thumb or pacifier. If left untreated, an overjet can lead to poor functioning of the teeth and digestive problems, as well as psychological distress from bullying and a lack of confidence in their appearance. Correcting the size of the upper jaw, and then repositioning the lower jaw with a Bionator or Twin Block is the treatment of choice. Unfortunately we see that many patients with this problem is treated by the extraction of upper premolars, followed by the upper front teeth pilled back towards the stuck back lower jaw in order to close the overjet. This procedure should be avoided at all cost. For more information you can visit our “Children’s Dentistry” page. Q. Why is my child’s lower jaw bigger than the top? A. The size of the lower jaw is genetically inherited from our parents. It is not uncommon to see large mandibles (lower jaw) occur in a family. A larger than average mandible is called a Class 3. Early diagnosis is imperative for these patients. The aim of the treatment is to develop the upper jaw to address the imbalance in size with the lower jaw. Development of the upper jaw not only reduce or eliminate the need for lower jaw reduction surgery at a later stage, but can also reduce to amount of reduction required. An early indication of a developing Class 3 is the lower teeth overtaking the upper teeth in the growing child. A Cephalometric (x-ray) investigation can confirm the diagnosis at an early age and should be carried out as soon as a Class 3 is suspected. You can find out more on our “Orthodontics” page. Q. Are bleeding gums really a problem? A. You should never ignore bleeding gums – as the commercial suggests, you would never put up with bleeding eyes or other body parts! Bleeding gums are considered a wound and should demand immediate attention. They may be a sign of infection or early periodontal disease so please book an appointment with one of our hygienists at your earliest convenience. In the meantime, you should continue with your daily oral health regime. Floss twice a day directly before brushing. Brush with a fluoride toothpaste, ideally with probiotic present and rinse with Corsodyl Mouthwash for bleeding gums twice a day as directed. Q. Will I be able to drive following treatment? A. Under routine care, our treatments will not affect your ability to drive. However, if you require sedation you will may feel unsteady for some time following treatment and will need someone to drive you home. Q. Iʼm nervous about needles is there an alternative? A. Where local anaesthesia is required, a needle is the only option but our painless injection technique reduces the stinging sensation and ensures that the procedure is more comfortable. Dr Stefan’s ‘shaky-shaky’ technique minimises discomfort and is often done in stages that allow for the rest of the injection to feel relatively painless. Q. Is the painless injection truly painless? A. The painless injection technique uses the very latest computer aided technology to deliver the required anaesthetic at much slower rates. This combined with prior application of local anaesthetic cream means that whilst you may feel a small scratch, the rest is relatively pain-free. A. We understand sometimes that unforeseen circumstances result in cancelled appointments. We would request, however, that you let us know as soon as possible, and ideally with at least 24 hours notice. A fee may be charged if an appointment is broken or cancelled without 24 hours notice. You can visit our “Contact Us” page or call us on 01481 721691 to cancel your appointment. Q. What if I need emergency treatment? A. Contact our surgery immediately and we will endeavour to schedule you in for urgent treatment. If your emergency is out of normal working hours, please contact 01481 721691. Q. I have just moved to Guernsey or I am currently registered with another dentist, is there anything I need to do to transfer my file to you? A. While file history can sometimes be useful, we generally like to make a full assessment of your current dental needs ourselves, and develop a plan of action for you going forward from there. If we feel we require further information we will ask for your permission to obtain your previous dental records. You can register online and book your first check up online. Q. I’m really scared of the dentist, what should I do? A. Never let dental anxiety put you off visiting the dentist. When you make your appointment tell our receptionist that you are nervous and we will try and help you to cope with the treatment. If you unable to have treatment normally due to nerves, we can offer a a registered, qualified psychotherapist to work with you both before and during your treatment, although this will incur an extra fee. A. If you wish to make a complaint about the service provided by QRDC please contact our Principal Dr Stefan Cloete directly, either by email to stefan@qrdc.co.uk or in writing, to raise the issue. Patient contentment is our priority and we will do everything we can to ensure the situation is resolved to your satisfaction.